Whether you are planning to have an intimate wedding or an exorbitant one, Rodas will surely match your unique choice, budget, and requirements. With a capacity of accommodating up to 75 in seating and 150 in floating, the venue has a cosy and comfortable interior for the guests. It also offers an in-house team of caterers that puts all the efforts to delight the guests with mouth watering multi-cuisine dishes. If you are looking for an elegant venue for a pre-wedding or wedding function, Rodas, Powai, Mumbai might be the perfect one for you. With spacious halls that can be customized to suit every requirement, the venue offers something for everyone. Decorate the space as per your style or theme and watch as the venue comes alive with an array of decorations and ambient lights. Complement the stunning venue with a delicious feast, that your guests will surely relish. Venue does not allow outside caterers. Venue does not allow outside decorators. Venue does not allow outside DJ. Venue does not allow outside alcohol. Venue is available in the following time slots: 09:00 a.m. - 05:00 p.m. (Morning) 7:00 p.m. - 12.00 p.m.(Evening) Changing rooms are provided to the bride and groom. Charges applicable. Venue has rooms available for accommodation: 36 rooms. The venue has parking capacity for 50 vehicles and provides complimentary valet services. The nearest railway station is Kanjurmarg Station. Landmark - Near D Mart. An elegant venue, Rodas, Powai, Mumbai is just the right place if you are looking for a venue that can host events for multiple occasions. It is apt for pre-wedding or wedding functions like mehendi and sangeet. You can also plan an intimate wedding at Rodas Banquet, Powai to treat your guests with some excellent facilities. The hall is Air-conditioned and can accommodate a large gathering. You can get the venue decorated as per your style or theme and watch as the venue comes alive. Treat your guests with a delicious feast as the venue has arrangements for food and catering. 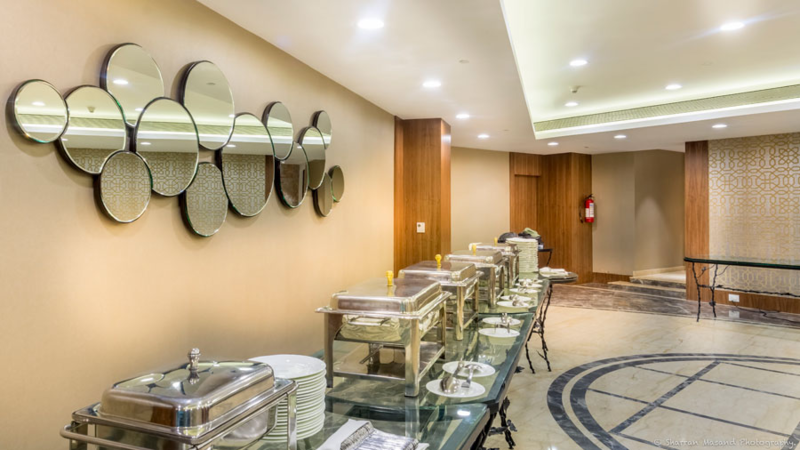 Located near Haiko Supermarket, Rodas Powai Banquet Hall allows baarat and hawan as well.